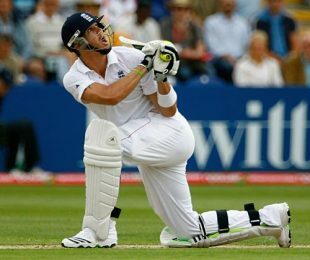 Kevin Pietersen has his sights set firmly on greatness, but he'll never scale the heights that are so clearly marked out for him, unless he can find a way for his inner genius to hold sway over the lunatic that, just occasionally, bursts forth to ransack his reputation. His hubristic dismissal to Nathan Hauritz, midway through the final session of another compelling Ashes opening day, was a moment that could have proved fatal to England's prospects in this first Test. That it had been glossed over by the end of the day was thanks to a stunning, and - if truth be told - unexpected counterattack from Matt Prior, whose No. 6 credentials had still been in some doubt despite his success against West Indies earlier this summer, and Andrew Flintoff, whose straight-hitting 37 was a brief but welcome throwback to his 2005 pomp. Though both men fell before the close, their stand of 86 in 95 balls - including 39 in 40 against the second new ball - transformed a scorecard that had been flaccid in the extreme at 241 for 5, at the moment of Pietersen's aberration. Shortly after his hideous flap at Hauritz's threat-free spin, Pietersen was caught by the cameras slapping his forehead on the pavilion balcony, and little wonder. He has a self-destructively disdainful attitude towards spinners of all shapes and sizes. Like Viv Richards, the batsman he most resembles in terms of presence at the crease, he regards spin as little more than a useful setting on a washing-machine, and for the third time in 12 months, a wilfully foolish stroke had handed the initiative straight back to his opponents at a critical juncture of the contest. True to form, Pietersen was defiantly unapologetic at the close, and blamed an imperceptible deflection off his helmet for the way in which the ball ballooned to Simon Katich at short leg. "When you get out, you're out, you can't do anything about it," he said. "It could have gone down to fine leg and I'd have got away with it, but it hit my helmet and I was out. You guys look a lot deeper into it than I do. I got out. I don't think I pre-empted the shot, he maybe outfoxed me a little bit. But it was just unfortunate it hit me on the head." So be it. It is simply the Pietersen way, and had it not been for his outrageous contempt for reputation against the last Australian team to visit these shores, England might never have pulled out of their final-day nose-dive at The Oval in 2005, and secured the series that turned today's contest into the most hyped and anticipated English Test match for four years. But ominously for England, both of Pietersen's most recent brain-freezes were directly attributable to two of their most traumatic defeats of the recent past. At Edgbaston against South Africa last summer, he went for glory with six needed for his century, and slapped the hitherto cowed left-arm spinner, Paul Harris, straight to mid-on. Then, in Jamaica in February this year, he mowed Sulieman Benn for four, four, six to race to 97, and then one ball later smeared a top-edged hoick to the keeper. Today, Pietersen's treatment of Hauritz put across the impression that he considers him unworthy of sharing such an illustrious stage, even though his subsequent assessment was improbably (and suspiciously) flattering. Throughout his innings he was two-parts dominant, and one-part disaster-courting. His third shot against the bowler was a top-edged sweep that landed safe at fine leg, and on 27, he gave Hauritz the charge, only for the ball to tweak sharply and crash into his back pad. Against the part-timer, Michael Clarke, he was barely any more complimentary, and in the final half-hour before tea, he came excruciatingly close to being bowled round his legs, as he wandered casually across his stumps and failed to make contact with a wafty sweep. It's part of the thrill of Pietersen that he can conjure shots that mere mortals would not countenance, but the Achilles heel that hampered his running between the wickets today was nothing compared to the one that ultimately got him out. "It's just the way he plays, really," said Australia's coach, Tim Nielsen. "He tends to take the game on, and he was pretty keen not to let our spinners settle. He swept probably 15 times beforehand and played them all quite well. If you get out to a cover drive you don't say 'don't play the cover drive'. He hits the sweep well, you miss one and hit one in the air, that's the way goes sometimes." Of course, seeking to dominate the acknowledged weak link of the Australian attack is one thing, but Pietersen's blind spot for spinners gives no thought to reputation. During the last Ashes, in that infamous tussle in Adelaide, he memorably claimed to have tamed even the mighty Shane Warne, after grinding him into the leg-side rough during his 310-run stand with Paul Collingwood. However, after bruising first-innings figures of 1 for 167, Warne bowled him round his legs in the second dig with a massive ripper. And the rest very quickly became history. Adelaide was unquestionably on the mind during Pietersen and Collingwood's redemptive stand of 138, during which they eased through the entire second session without offering a chance or facing an attacking fielder. No England pair had batted with such serenity against Australia since that fateful second Test in 2006-07, which made the subsequent soft dismissals of both men all the more disappointing for a fervent Anglo-Welsh crowd. But as a statement, the speed of England's scoring - from the top of the order where Ravi Bopara mixed cat-on-a-hot-tin-roof footwork with a handful of sumptuous boundaries, to the Prior-Flintoff alliance late in the day - was reminiscent of the chaotically successful onslaughts that England produced at Edgbaston and Old Trafford four years ago. They have runs on the board and two spinners to exploit what is already appreciable turn. And for the first time for 12 years and seven campaigns, they've claimed at least a share of the first-day Ashes spoils. "I could be greedy and say we'd like to be four or five down, and myself and Colly missed out on opportunities to get a real big score, but the way previous Ashes series have gone Australia's way on day one, we'll definitely take 336 for 7," Pietersen said. "The one great thing about today was how positive we all played. We are here, and we want to compete this summer in a very, very big way."